While we try to provide you with comprehensive coverage from a number of major tournaments around the world, sometimes there is simply too much going on in the world of tournament poker to cover each and every event, and this is precisely what has taken place over the past week or so. While we were busy keeping you abreast on the latest chip counts and reports from the WPT Five Diamond Poker Classic and the Epic Poker League Main Event, a few tournaments flew by under the radar. With that in mind this article should get you caught up on all of the recent tournaments in the poker world that we unfortunately haven’t given the coverage they deserve. The $3,500 WPT Championship Event in Venice saw a dramatic decrease in attendance, but a lot of the top young talent in the poker world made the trek to Italian city for a chance at a WPT title. One budding star, Steve O’Dwyer, narrowly missed on making that dream a reality as he was bested by Italian Edoardo Alescio. The latest $1,500 Main Event on the WSOP Circuit Series took place for the 10th to the 12th of December in Atlantic City, New Jersey, and saw a total of 262 players register, creating a prize-pool of over $380k. In the end it was Tuan Phan who would pocket the $188k first-prize as well as a coveted WSOPC Ring. The inaugural NACPT took place over the course of two days (December 10th and 11th) in Durant, Oklahoma, with the $1,000 buy-in Main Event drawing a very respectable field of 324 players including some legends in poker world like Oklahoman and Poker Hall of Famer TJ Cloutier. With a fairly progressive payout schedule 20 players made the money in the NACPT Main Event, with the winner, Kirk Stewart, booking not only a $68k payday but also an upcoming feature in Card Player Magazine (the sponsor of the NACPT). 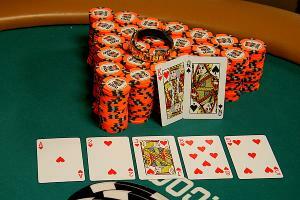 This entry was posted on Monday, December 19th, 2011 at 9:40 pm and is filed under Poker News. You can follow any responses to this entry through the RSS 2.0 feed. You can leave a response, or trackback from your own site.